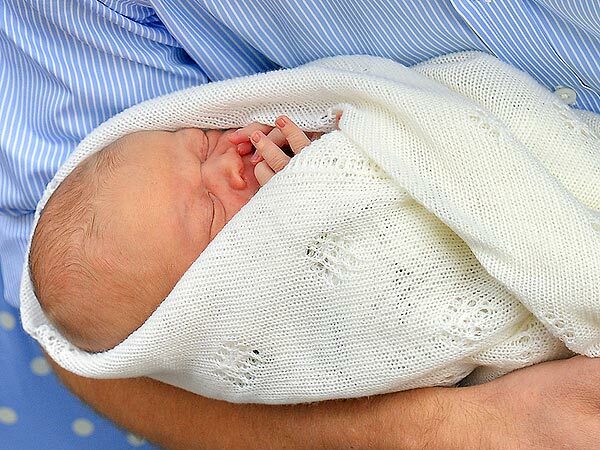 The Prince of Cambridge: Here’s the First Look! Hail to the (future) king! The world got its first glimpse of William and Kate‘s newborn baby boy Tuesday on the steps of St. Mary’s hospital in London. 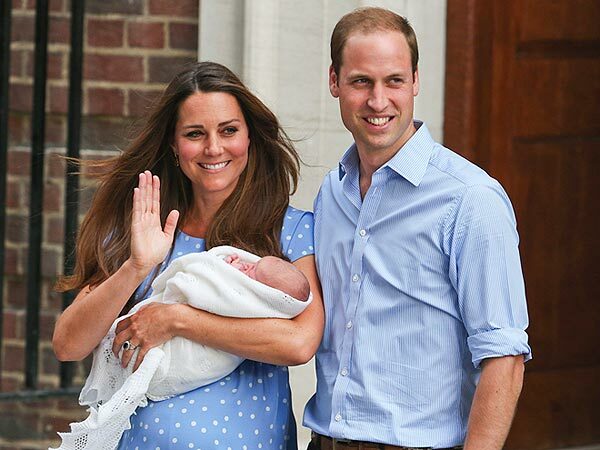 The day-old prince, swaddled in a blanket, already looked to be waving to the crowd. 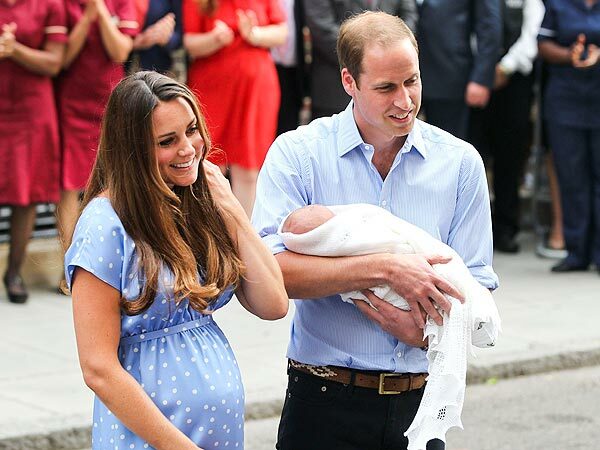 The Duke and Duchess of Cambridge did not reveal the baby’s name – preferring to wait, much as William’s parents, Charles and Diana, did 31 years ago in delaying the revelation of his name for several days. “We are still working on a name, so we will have that as soon as we can,” William told reporters gathered outside the hospital. Stepping out of the hospital to cheers, Kate wore a bespoke cornflower blue crepe-de-chine dress by British designer, Jenny Packham, while her husband William wore a matching blue button-down shirt. 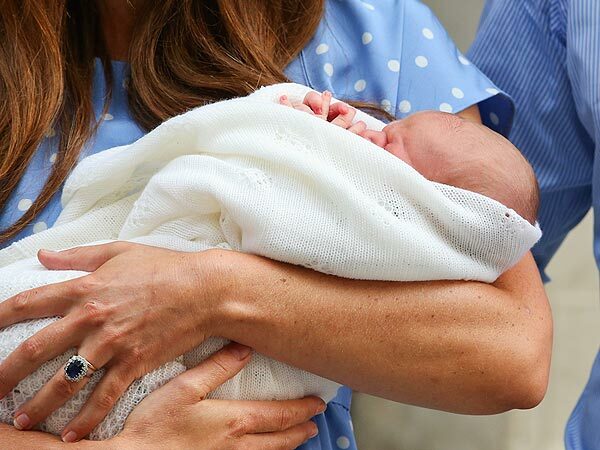 “It’s very special,” added William as he held their newborn, wrapped in an aden + anais muslin swaddle topped with a lightweight blanket. As for the baby’s hair, “He has way more than me, thank God,” said his father. 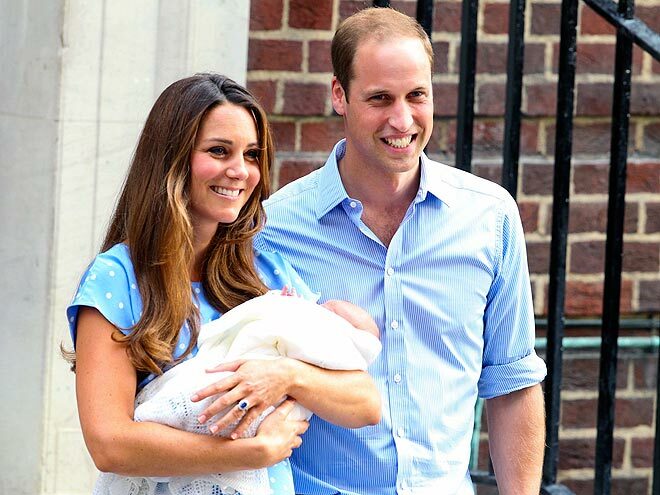 Regarding the changing of the diaper: “He’s done his first nappy,” Kate said of the proud dad. Royal sources confirm William practiced putting in the Britax Baby Safe car seat and driving away in the run-up to his smooth performance Tuesday. In a statement from the Palace, the young couple continued to thank the hospital staff – just as they did earlier that day. For Hugh Jackman, being a blockbuster, A-list actor often earns him a “meh” at the very least from his two kids. Even with The Wolverine set to open this weekend, he says they resist the urge to act like his biggest fans. “They’re not going to give that up to me. They’re not going to be like, ‘Yeah Dad, you’re the coolest! '” Jackman told PEOPLE Wednesday at The MOMS’ Mamarazzi event in New York City. His son Oscar, 13, is especially having trouble adapting to dad’s spotlight, Jackman says, having been frequently photographed with sister Ava, 8, over the years. But even though Jackman, 44, knows that doing more interviews will “get him in trouble,” he can’t help gushing about his children – like about what they want to be when they grow up. Oscar’s going to be an artist, he says proudly, and Ava would be happy doing anything that involves “handling animals, cooking, singing and poetry.” They may not want to follow in dad’s footsteps as an actor, but that’s fine with him.